In lieu of our usual program, we will enjoy our annual covered dish dinner. 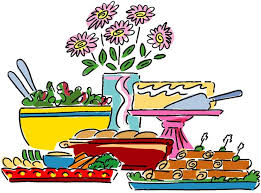 Please bring a favorite dish to share with the group. If the weather behaves you might also want to bring a lawn chair. 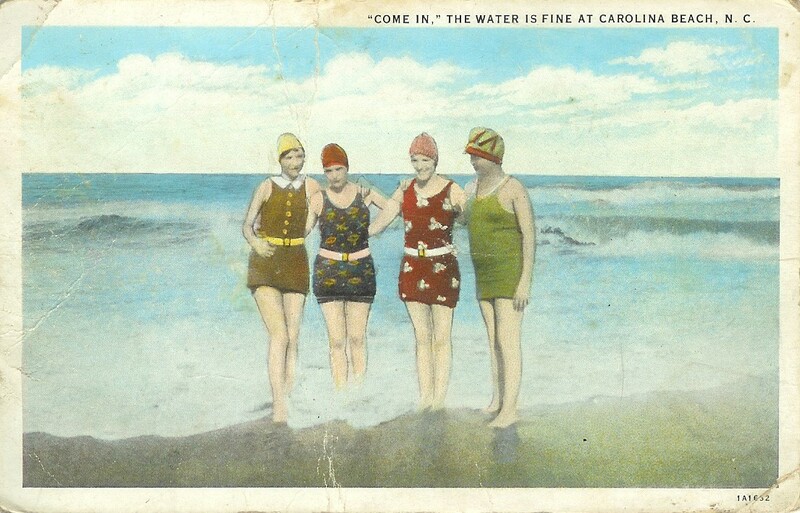 This summer the Federal Point History Center, located next to Town Hall at 1121-A North Lake Park Boulevard, will host an exhibit called Vintage Bathing Suits: 1900-1990 which includes 23 suits from the time period. The exhibit will be open on Tuesdays, Fridays and Saturdays from 10 am to 4 pm during June, July and August. The oldest suits are from the 1900-1920s and look more like dresses than bathing suits. All three are fine worsted wool and were worn with stockings and bathing shoes. There is an emerald-green ladies’ suit in silk taffeta with a flared skirt over cotton bloomers. There is a yellow woven rayon two piece with a bra like top and trunks from the waist and a green woven cotton two piece with a halter top. We invite locals and beach visitors alike to visit our exhibit this summer at the History Center. Call us at 910-458-0502 or email at rebecca@federal-point-history.org and please visit our Facebook page at Federal Point History Center and like us. 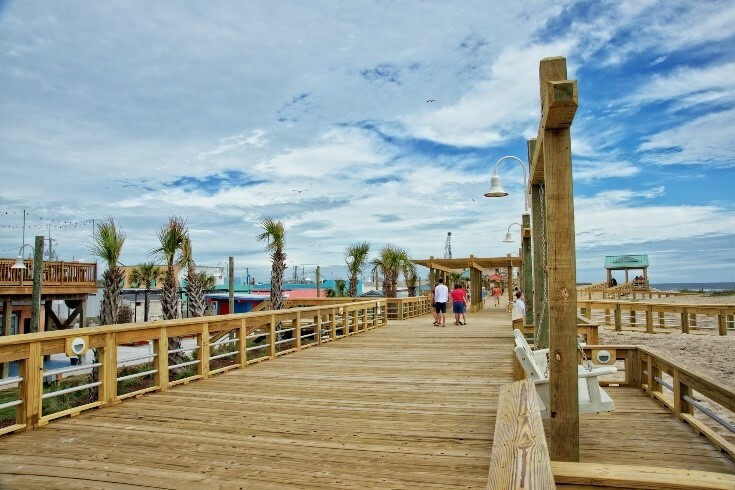 We are currently planning an outreach program that will put our members on the Boardwalk one or two nights a week, in June, July and August. 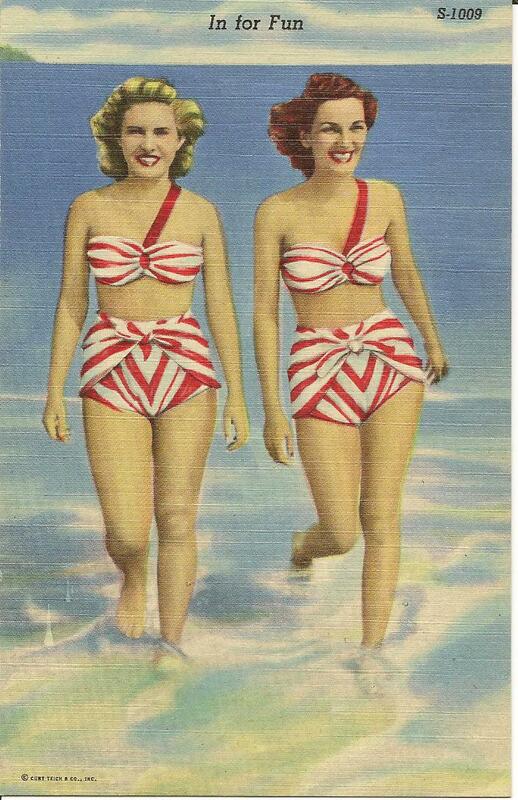 On June 12th from 2-4 pm we are having a reception for the opening of our summer Vintage Bathing Suit Exhibit. 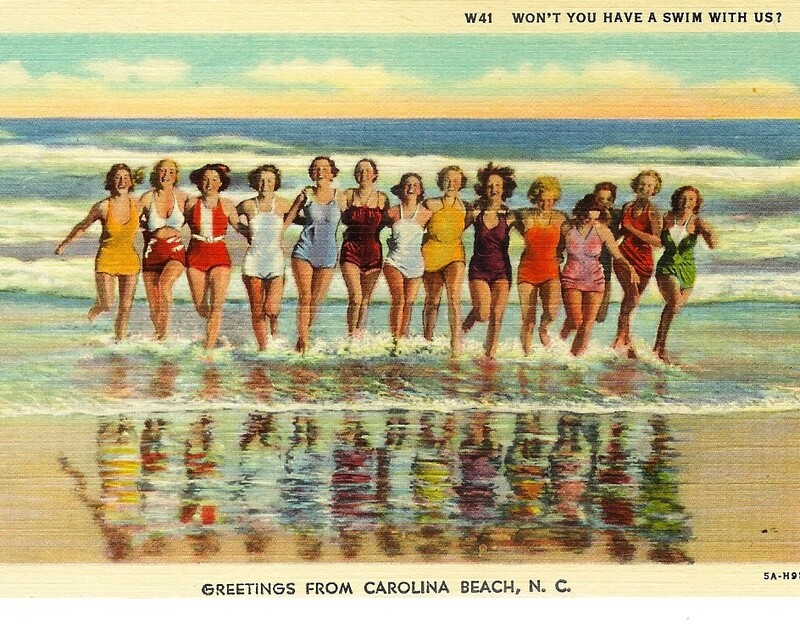 So, we are continuing to showcase Carolina Beach bathers. The postcard to the right has a “white border” which means that it dates from 1915 to 1930. It was published by John Plummer for his store on Cape Fear Boulevard across from the Bame Hotel. Plummer was the first mayor of Carolina Beach when it was incorporated in 1925. His store was a popular place to shop since he carried a variety of goods and was also the post office location at one time. The bathers are wearing suits still made of wool knit but without shoes, stockings and sleeves. Three have webbed belts and look almost like very short dresses; one even has a collar and buttons going down the front. All the ladies are wearing hats. 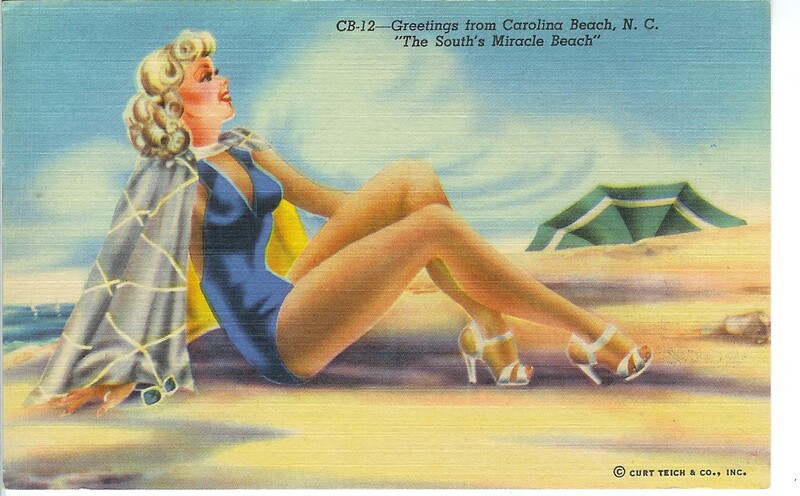 The linen card to the left with the very glamorous beauty sitting on the beach can be dated 1941 since it has the phrase “The South’s Miracle Beach”. 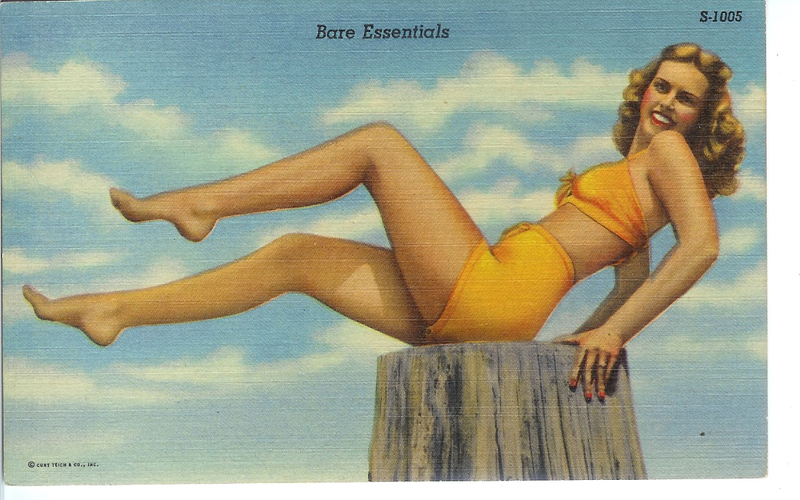 It was used on many cards published after the devastating boardwalk fire of September, 1940. The miracle was that the two blocks of destroyed boardwalk businesses were rebuilt and ready to open by beach season 1941. She is wearing a one piece suit probably made of wool knit with lastex. In the mid-1930s the U.S. Rubber Company perfected a rubber thread which could be combined with cotton, wool, silk or rayon fibers to make a stretchy thread. It was used for women’s foundation garments, bathing suits and a number of other uses and revolutionized the swim suit industry. 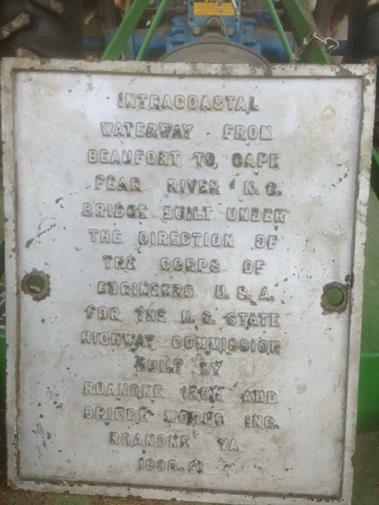 Built By The Roanoke Bridge and Iron Works Inc. The Exhibit Committee (Elaine Henson, Darlene Bright, Demetria Sapienza and Rebecca Taylor) is currently working on two upcoming exhibits. We will showcase Snow’s Cut beginning in the early Fall of 2016, and commemorate the United States entry into WWI beginning in 2017. We are also looking for ideas for additional rotating exhibits that will run for 3-6 months at the History Center and may be offered to other local institutions. Please send your suggestions to Rebecca at Rebecca@federal-point-history.org. 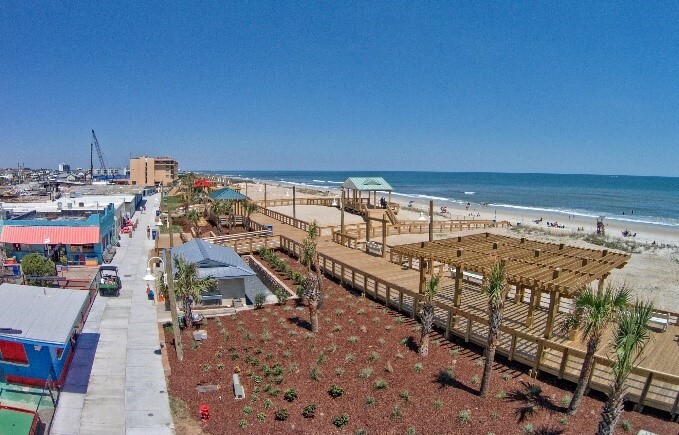 Atlantic Towers, located conveniently right between Carolina Beach and Kure Beach, has been a Business Member of the Federal Point History Center for years. We are very proud of their contribution to the History Center as well as to our community. If you are looking for family friendly lodging for a day, a week, monthly, or a weekend, give them a call. They have so many pluses on their marquee. For example, ocean front condominiums, private balconies, indoor heated pool and outdoor pool with gazebo & sundeck. Free Wi-Fi, club room, laundry room, and game room. Full kitchens and linens. Free parking is available as well. 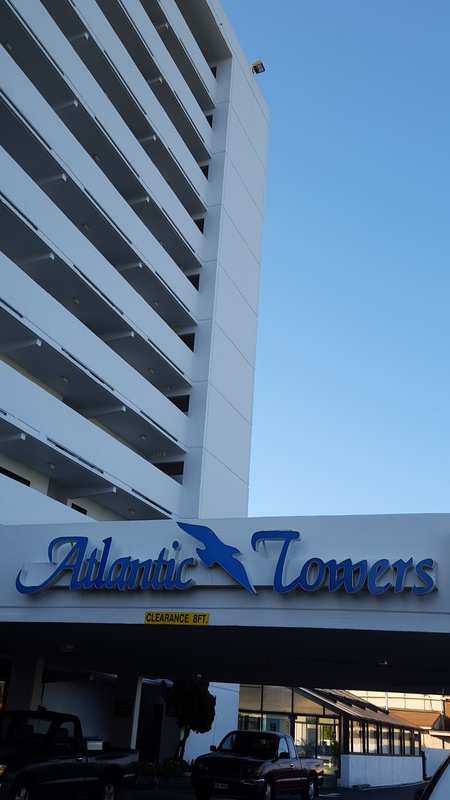 With eleven stories, you can seemingly see forever and once you stay at Atlantic Towers, you will settle for nothing less. The next time you need lodging for a Pleasure Island vacation, call them and book your room with one of our best supporters and mention that you appreciate their long time support of the Federal Point History Center and after registering, why not visit the History Center?